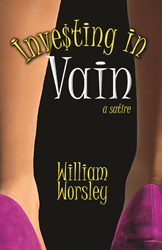 Distinction Press announces the publication of Investing in Vain, a satirical novel that lampoons socially responsible investing and political correctness. Investing in Vain is a rollicking romp through the asset management industry. Worsley’s rapier wit mercilessly lampoons the latest fashions of social umbrage and chronicles the misadventures of political correctness run amok. Distinction Press announces the publication of Investing in Vain, written by retired investment manager William Worsley. Portraying a world of political correctness run amok, the novel is a modern satire that distills the follies of our time with memorable one-liners, jarring juxtapositions, colorful images, and deadpan humor. Although the immediate subject of the comedy is socially responsible investing, the bigger story is about moral pretense. No wonder it takes place in Washington, D.C. The main character is Bruce Benson, a nerdy quantitative analyst at Quandary Capital who stumbles upon the last great secret for beating the stock market, only to have his entire world turned upside down as a result. Forced to flee, Benson assumes the guise of a transgender to work at Vain Capital, a Washington firm promoting morality-based investing to its self-righteous clients. There he joins buxom Alison Hartswell in her frustrating search for gay money managers to help re-elect the pandering governor of California. Throughout the book the main characters blunder through a politically correct world they have neither created nor endorsed, but despite their best efforts to accommodate their demanding clients they accidentally become entangled in an international power struggle that threatens to ignite World War III. The novel has transgender investment managers, Russian skullduggery, asset managers catering to the latest in social umbrage, and an absurd mystery underlying the ultimate stock market anomaly. It’s a riotous tale of financial markets, politics, and modern mores – a perfect tribute to the mad times we live in. The book is available in tradepaper, hardcover, and e-book. More information is available at the book’s website, http://www.investinginvain.com, or the publisher’s site at http://www.distinctionpress.com. William Worsley learned about what goes on inside money management firms by hiring, firing, and monitoring them on behalf of large pensions, endowments, and foundations. During his career he met with hundreds of U.S. and international investment firms specializing in public and private equity, fixed income, and currency hedging. A chartered financial analyst, he has been investing in the stock market since he was 13. In 2016 he retired as managing director of a firm that oversees money managers. In an earlier career he was a senior text editor at Time-Life Books, where he wrote and edited articles on a wide variety of popular topics. He holds three degrees from the University of Virginia, including a B.A. and M.A. in English, and an M.B.A. from the Darden School. He lives in the Washington, D.C., area, where he was born and raised.